Our cover picture is that of Bill McEvoy, North American Chairman of Comhaltas Ceoltóirí Eireann. This portrait was commissioned last June from Fleming Christofferson and reflects the many facets of the North American Supremo of our cultural movement - his love of Irish traditional music and the strong ties which he has forged between his homeland and the land of his adoption. This year we celebrate the 25th anniversary of the first Comhaltas Concert Tour of the United States and Canada. There possibly would be no such Tour without the indomitable leadership provided by Bill McEvoy. In the intervening years, the Tour - and the movement on this vast continent - has gone from strength to strength under his guidance. Last year his native county of Laois selected him as Person of the Year and accorded him a Civic Reception, an accolade previously awarded to only two other people - former President of Ireland Dr Patrick Hillery and current President of Ireland Mary Robinson. This was an indication of the esteem in which Bill was held and the admiration which exists for his tremendous work for Ireland and her native culture. To Bill, his wife Lily and all his family we send our best wishes and greetings from Ireland. Go raibh rath Dé ar ár saothar. 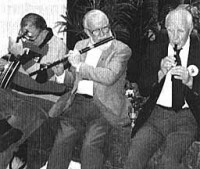 The 25th anniversary of the North American Province of Comhaltas Ceoltóirí Eireann will be celebrated in Boston, Massachusetts next April when the Hanafin-Cooley Branch and the Northeast Region host the 1997 Convention.